Title: Welcome to the Madison Math Circle! Abstract: At the Madison Math Circle, we aim to give a flavor for the creative type of thinking that goes into mathematical research. In this week's interactive activity, students will explore questions related to Mobius strips, developing their own conjectures. Title: Math is a game! When mathematicians are working to solve a theoretical problem, it often helps to imagine that we are playing a game: What could our opponent do to make our job as difficult as possible, and what is our strategy to defeat them no matter what move they make? In this session, we will try this out by playing several games and trying to come up with winning strategies. Abstract: We will try some geometric puzzles related to area, volume, and dimension using techniques such as drawing diagrams, looking at special cases, using symmetry, and changing perspective. Abstract: I come from an alien world where we spend all of our time playing a game called hackenbush. I'd like to introduce y'all to this game so you don't embarass yourself if you come visit my planet. Title: Escape of the Clones! Abstract: We wish to find an invariant (an invariant is a quantity that doesn't change no matter how the process plays out). By playing couple of games will help us find some! The main game we will play is Escape of the Clones! Promise you will like it! Abstract: Beginning with the classic Towers of Hanoi puzzle, we'll explore several puzzles whose solutions can often be found by thinking recursively. We'll also discover how recursion and related methods of simplifying problems can be used to create efficient algorithms to solve a variety of practical problems. Abstract: The most important invariant associated to a collection of featureless points is their number, which can be found using a process called "counting". We explain a generalization of counting that works for other, more interesting shapes. For example, we will count a circle and a sphere. We recall typical counting arguments, and try to apply them to shapes. Title: How to Outsmart a State Test? Abstract: A common problem in a state test is given a sequence of numbers like 4, 9, 16, 25, 36... ask what the next number to expect. I used to dislike these problems up until a teacher taught me a cool trick. In this talk, I want to share this trick and discuss the math behind this. I'll discuss the motion of little mathematical bugs: they hop around the positive integers, flipping direction arrows as they go. How many such bugs drop off the line at -1, and how many escape to infinity? Next, we tackle a similar problem in the plane, and discover beautiful geometrical patterns, known as Propp Circles. I don't know what will happen in this talk. No, I don't mean that in the sense that math teachers often use, where they say "I don't know, why don't you try it!" but really secretly they know what's going to happen. I mean that in the most literal sense. I will introduce sequences of numbers that (sometimes) bounce back, and you will explore them, and I might learn something, because I don't know what will happen. We'll have a blast, and maybe we'll discover something that no-one ever has before. If you fold a loop of paper in half and cut it down the middle, how many loops of paper do you end up with? 2? Would you believe me if I said 1? How is this possible? A magician would never reveal the secret, but a mathematician will. We will learn to draw & construct loops & Mobius bands and explore their intrinsic & extrinsic properties. An old legend tells of a mysterious temple located in Hanoi, Vietnam containing three pegs and 64 golden disks. Since the beginning of the world, priests have been moving these disks across the pegs according to rules handed down by an ancient prophecy. The legend states that when the final disk is placed, the world will come to an end. We will examine these rules and decide whether we should be worried by this legend. The Pigeonhole Principle is the statement that if you have if you have (n) pigeonholes, and you want to stuff (n+1) pigeons into these holes, then one of the holes will have at least two pigeons in it (why mathematicians want to stuff pigeons into holes at all is a excellent question for another time). While the Pigeonhole Principle might seem obvious, it can be used to prove things that are not at all obvious with relative ease! We’ll explore how to use this simple fact to solve a variety of problems. In this bored state my mind would often wandered, and I would wonder about important things like "Will I have a date for prom?" or "What is the cafeteria serving for lunch? 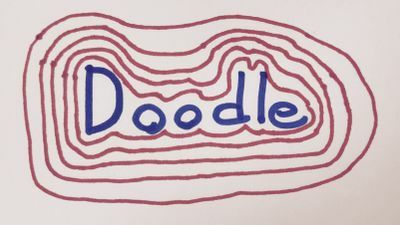 ", but germane to this talk were my wonderings about, "What’s happening to the shape of this doodle?" It turns out that these idle daydreams and doodles provide a good taste for how mathematicians "do" math. We will start by doodling and asking questions, and then we'll see where these lead us mathematically. Every tangled cord you have ever encountered is secretly a number. Once you learn how to count these cords, cleaning your room will be as easy as 1-2-3. We'll learn about sound waves by hearing and seeing them in action. We'll start by seeing a different way to think about sound and how to manipulate it. With this new knowledge we can explore some elements of modern sound design. Help! Important data lost due to ink stains! John and Mary have a ledger card for office supplies, however their cat broke the ink bottle and got the card stained. Let’s help them recover those numbers with Chinese Remainder theorem! Abstract: In the distant planet of Zubenelgenubi 4, we live our life without numbers. I know, how do we pass our time if we can't construct a smartphone without numbers? The answer is that we have invented an extremely violent sport about chopping down trees called Hackenbush, and playing this game is an essential social skill in Zubenelgenubi 4. I will teach you how to play the pen and paper version of Hackenbush, and hint at how learning this game leads to a kind of math that is highly illegal in 254,233 planetary systems. Title: Fractals, Fractions and Fibonnaci. Abstract: Let’s go on a history tour! We’ll visit some math objects that intrigued generations of mathematicians and explore connections between them. We'll observe something that happens a lot in modern mathematics: discovering connections among seemingly unrelated things! Through this talk I hope to introduce you to how vital it is for mathematicians today to be able to effectively communicate with and teach each other even if they work in very different branches of mathematics. Title: 1+1 = 10 or "How does my computer do anything?" Abstract: Computers perform all sorts of complex tasks, from playing videos to running internet browsers. Secretly, computers do everything through numbers and mathematics. Even weirder, they do all of this with "bits", numbers that are only 0 or 1. We will talk about bits and how we use them to do the mathematics we're familiar with as humans. If we have enough time, we will discuss "addition chains" and how computers use them to speed up their computations. Abstract: So much wonderful and useful mathematics was discovered centuries ago that it can seem as though we must know everything by now. To the contrary, thousands of research mathematicians around the world are working to develop new mathematical theories every day. I will talk about some exciting recent discoveries in math and some tantalizing unsolved problems. To make matters more concrete, students will develop a solution to the Erdős Discrepancy Problem, which was only completely solved in 2015, in a simple case. Abstract: You're walking home from school, and you pull your headphones out to listen to some tunes. However, inevitably they are a horribly tangled mess, but are they really a knot? We'll talk about what exactly is a knot, and how we can tell when something is not the unknot. Title: What if seven is zero? Abstract: We take as axiomatic the usual laws of arithmetic, along with a new law: 7=0. Evidently, this new law challenges certain widespread intuitions about numbers. Will all of mathematics crumble? Title: Is math destroying the right to vote? Abstract: The Supreme Court is deciding whether or not Wisconsin’s way of electing the State Assembly violates the Constitution by depriving Wisconsinites of their right to representation. The key issues in this case are really about math, and how legislators armed with powerful algorithms can design electoral districts so that they choose the voters, rather than the voters choosing them. On the other hand, we can use math to find unfairness in maps and suggest better ones — I’ll talk a little bit about how. Title: From Patterns to Functions? What is a pattern? What's the next number in the sequence 1,2,3,4,5? What about 1,4,9,16,25? Why that number? In this talk we'll talk about how to find the next number in many sequences, and where it comes from. In addition we'll consider the relations between functions an patterns. Title: What does math research look like? I’ll try to illustrate the type of thinking that goes in math research by having us all dive into a famous historical problem. Computers perform all sorts of complex tasks, from playing videos to running internet browsers. Secretly, computers do everything through numbers and mathematics. Even weirder, they do all of this with "bits", numbers that are only 0 or 1. We will talk about bits and how we use them to do the mathematics we're familiar with as humans. If we have enough time, we will discuss "addition chains" and how computers use them to speed up their computations. Strategies are everywhere: how a business decides to deploy resources, how a school district decides on a curriculum plan, how a student decides which material to study for a test. In this Math Circle, we will discuss how mathematical ideas can inform strategies, focusing on simple games where perfect analysis of strategies is possible. I will discuss ways to cleverly send a message so that even if part of the message is lost, the entire message can be recovered. This page was last modified on 26 April 2018, at 13:48.